Before Go Mighty and the Life List I never really considered what things I wanted to do before I died except for this: as a kid I decided that one day I wanted to find a four-leaf clover in Ireland. And last November I did! Last year Scott and I took a work/travel trip to the UK and Ireland. 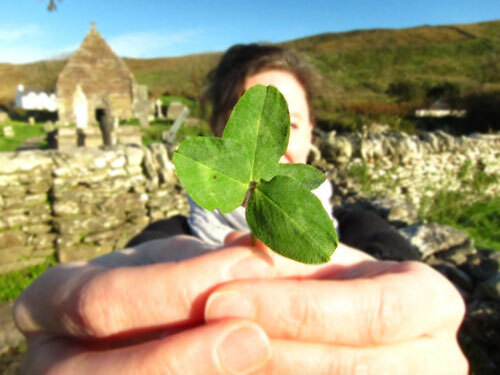 We only spent six days total in Ireland and on the second to last day I, ecstatically, found my four-leaf clover. It turns out that the urban parks, national monuments and historical locations in Ireland are very well tended — which means that patches of weeds (like clover) are not allowed to take over. 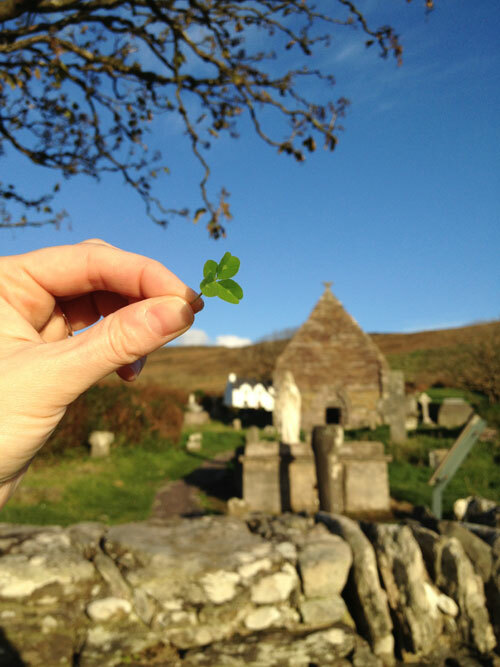 So I felt that much more lucky to spy a four-leaf clover outside the Kilmalkeder Christian Site in Kerry, Ireland. 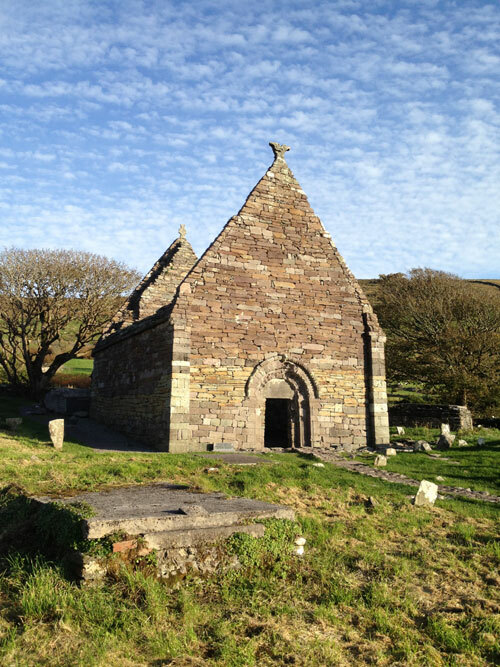 According to the Rick Steves guide book it was a Norman center of worship that became a 12th-century church where the old graveyard is rising spookily above the soil line while on the other side there are new gravestones being inscribed. We visited as the sun was setting on our second to last day in Ireland and I was beginning to fear I’d be leaving cloverless. I found a few four-leaf clovers in that precious patch and have them pressed inside a book. They aren’t the prettiest of clovers but they are my favorite because every time I see them middle school aged me is giddy. I’ve read about your four leaf clover endeavors in past posts. Knowing you’ve checked that particular task off your Life List makes me smile! The middle school aged sister/friend inside me is giddy with you! Love it. Such a feeling of, I don’t know, “rightness” isn’t it, when a dream comes true? I think the leprechauns thought you were a bit too sure that you’d find the four-leaf clover so they wanted you to work for it. But they must have liked you because, in the end, they let you have it!! And a few more to boot so you’d know it wasn’t that they didn’t exist, just that they were being hidden from you. We Irish will always come through in the end though! I love your pictures.